This is a Striking and unusual side sitting Straw Pillbox by Gabriela. 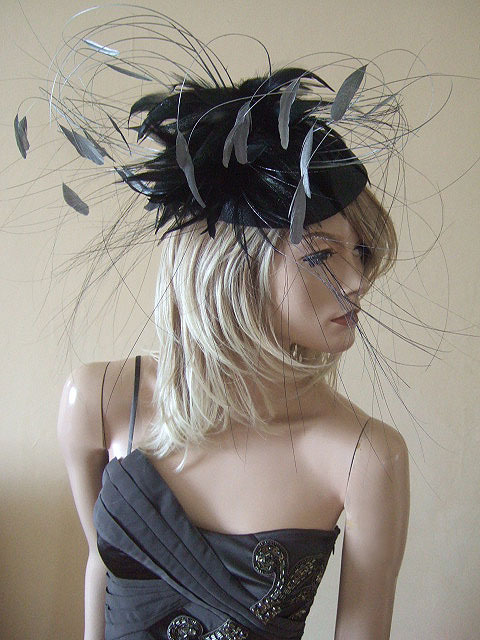 Pewter Dark Grey Pillbox Base, with Black Goose, and long Stripped Coque Feathers and Peacock Hurl. With the Stripped Coque Feathers Sprayed in Silver, and other Feathers just touched slightly in Silver. Very Chic and Modern take on the 40's Pillbox Fashion..
Polish born Milliner Gabriela Ligenza arrived in London 20 years ago, much to the delight of the style cognoscenti. International fashion icons, including Princess Diana, Princess Caroline of Monaco, Mrs Abramovich and Elle Macpherson have turned heads in hats and head-pieces by Gabriela Ligenza..
Attaches by a thin elastic band that wraps around the back of your hair.